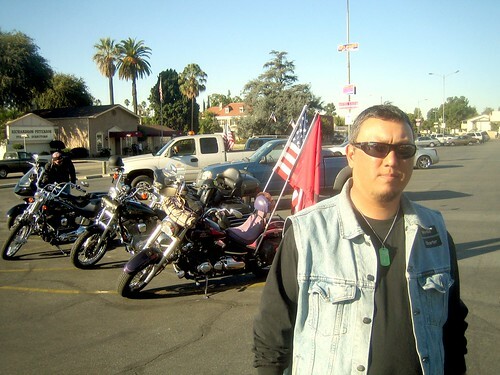 Yesterday (Oct 27) I attended my first mission of the Patriot Guard Riders. Here's how it went. The PGR is a group of people who provide the families of fallen soliders some peace and protection from protestors during the funeral process. It started because of a religious group called "Westboro Baptist Church" who sought to heckle these military funerals for the sake of gaining national attention and increasing their membership and finances. CNN has an article that goes in depth on this. The PGR doesn't invite themselves to these funerals. Rather, they get permission from the families. They watch for reports of fallen soldiers, and get in touch with military personnel to verify that a death occured. They ask an officer to offer their services to the surviving family. If the family accepts, the PGR springs into action. If the family refuses, the PGR stands down. Yesterday was a mission for fallen soldier PFC Jose Roberto Perez killed in action in Iraq. We all staged at a shopping center parking lot in Ontario, CA. Folks came riding in on bikes decorated in US and PGR flags. Most of them were veterans, a few were non-veterans. 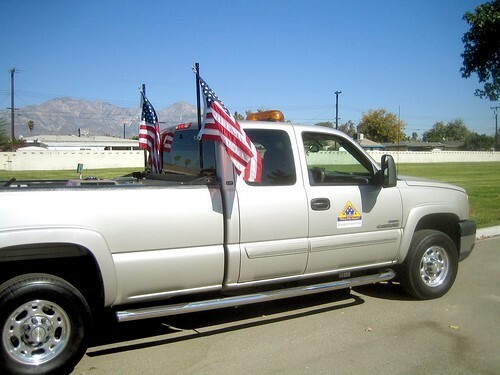 A couple of them didn't own motorcycles, but offered their cars and trucks as "PGR Support Vehicles" that carried water, chairs, extra flags, etc. At the start of each mission you are given a ride pin. Some of these guys have collected 30-40 pins. You also contribute a $1.00 to the mission and you get a dog tag containing the name of the fallen solider. Prior to the ride, they went over the details of the mission. A guy named "Winger" lead this mission. He said that he visited some of the web-forums where "the uglies" do their planning and learned that they planned to be at this funeral to protest. He gave instructions on how to create a human barrier against "the uglies", guys would stand side-by-side with arms locking with one another, in a non-violent stance. He said it was absolutely important not to retaliate against "the uglies" because they would be brandishing camera equipment in hopes of catching members of the PGR in the act of fighting. 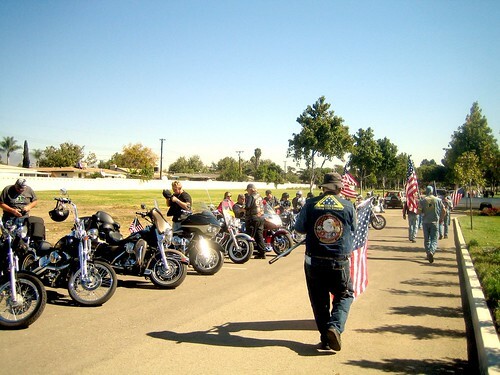 We put our kickstands up at 10:00am and headed out to St. George Catholic Church in Ontario, CA. 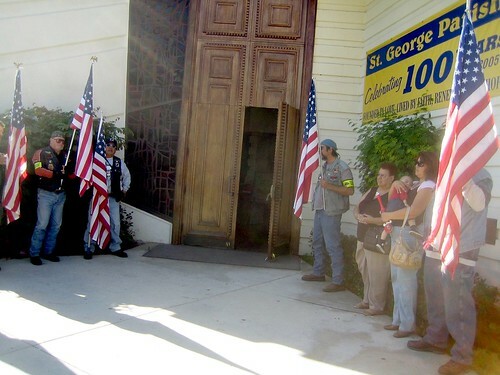 We lined up in front of the church entrance and stood with our flags while the casket was carried in. Once the procession entered the church, the PGR fell back and returned to their bikes. Then we waited for the service to finish. Most of the guys stood and chatted with each other, and with the Ontario police. About an hour-and-15-minutes later, we lined back up in front of the church for the casket to be carried out. Then we followed the hearse and limousine to Bellevue Memorial Park in Ontario. The bikes rolled by the interment area and parked at a fair distance away. We carried our flags and line ourselves up around the burial location to provide a wall that would shield the service. As it would turn out, "the uglies" didn't show up. But we remained there anyways to complete the mission. Leaders of this PGR mission offered a gift to the grieving family, and then the PGR fell out and returned to their bikes. Here are some photos. Vist my Flickr photo set for more photos. Me, at the staging area. And no, that's not my purple bike behind me. i went on my first ride on 11-4-06.It was a great feeling to honer a fallen soldier.